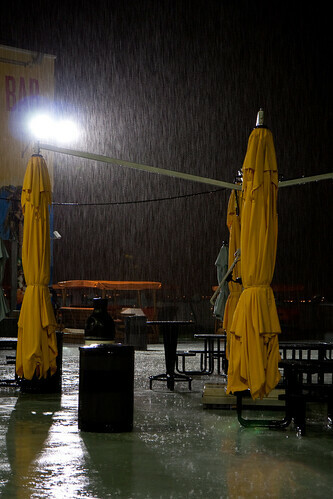 I have been doing a lot of photography lately, and entering a few photo contests. The results so far have been pretty good. 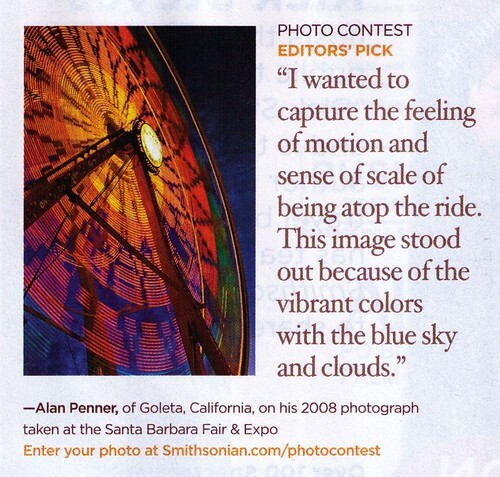 The Smithsonian Magazine is having their 8th Annual photo contest. 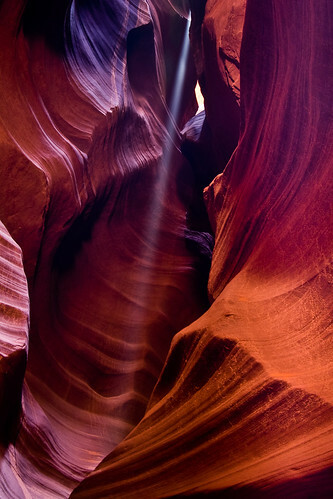 My picture (that I had made into a puzzle) was chosen as an editor’s pick. It hasn’t yet made it onto that portion of the website, but it is in the current (May) issue of the magazine. It looks like it’s the only one in the magazine so far, being used to promote the contest. 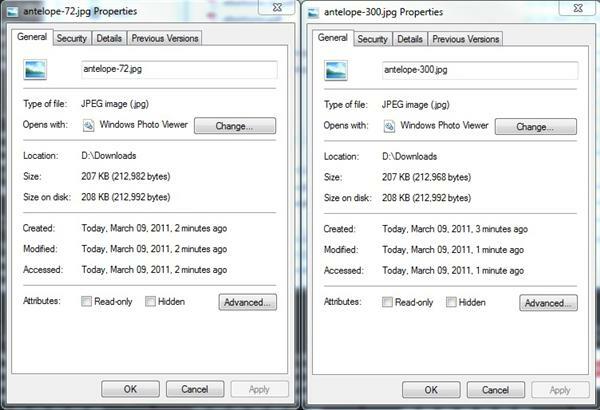 You can click through the scan to see the full page. I am in the process of getting a website up to sell prints. Keep an eye on Alan Penner Photography. I am hoping that linking to this will push me to actually get it done. I think it will. My original schedule when planning my baseball trip was to spend 4 days in Vegas at the end of it. This was partly because JetBlue doesn’t fly out of Santa Barbara, so I was using Vegas as my start and end points for the JetBlue all-you-can-jet pass. I got a room at the MGM, and was intending to just play a lot of poker at the end of the trip. That plan changed when the Twins beat the Royals on the last day of the season, to stay tied with the Tigers for the AL Central division lead. That forced a “regular season” playoff game to decide the division winner. 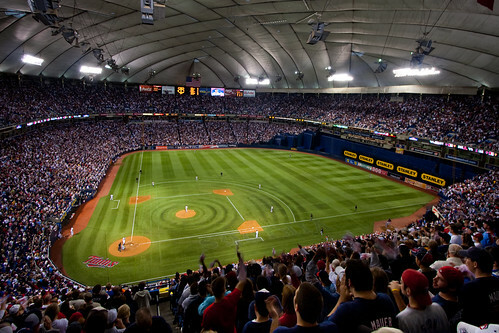 It would be the last regular season game ever played at the Metrodome, as the Twins were getting a new stadium for 2010, and I had never been there. I had to go. Getting a ticket was the easy part. As soon as they went on sale, several of my friends in the area were online refreshing the page to try to get them. Tim eventually got through, and got one for me. Now I just had to figure out how to get there. I was still in Seattle, and had a scheduled flight to Vegas (my last JetBlue AYCJ flight) the next morning. After some searching, I found a USAir flight from Vegas to Minneapolis that gave me two hours to get from the airport to the dome. Plenty of time, I was told. The city’s light rail went right from one to the other. Booked. Monday I flew from Seattle to Vegas, got checked in, played a little poker, and went to bed. 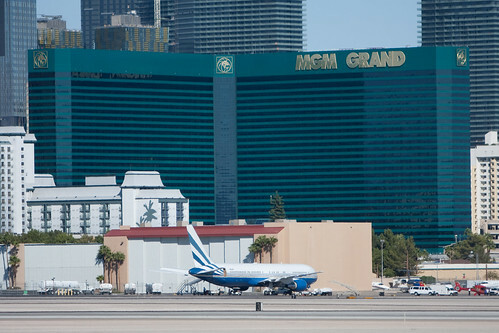 Tuesday, I headed back to McCarran for the second day in a row, to fly to Minneapolis. All I brought with me were the clothes I was wearing and my camera bag. The rest of my stuff stayed in my room, somewhere in this building. My flight was delayed 2 hours, due to weather in Minneapolis. Not good. Quite a few people on the flight were heading to the game, and were unhappy. Finally, after what seemed like forever, we took off and eventually landed in Minnesota. 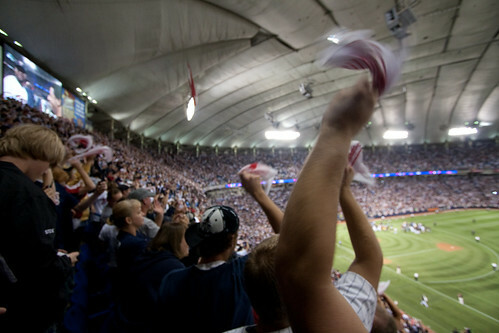 I rushed across the airport to the light rail, and headed for the Metrodome. The game started when I was a few stops away. 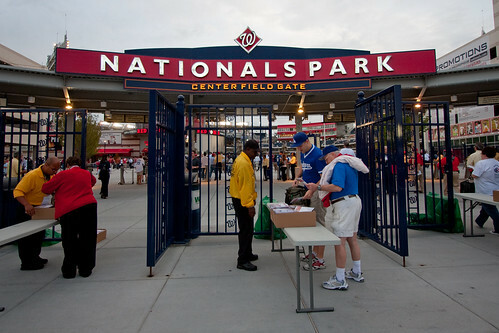 Tim was able to come down and give me my ticket through one of the gates, and I got inside, having missed just the first inning. Not much had happened, and the score was still tied at zero. I met Eric for the first time after getting to my seat. The rest of the game was incredible. The Tigers took a 3-0 lead in the 3rd. The Twins took a 4-3 lead in the 7th. The Tigers tied it up in the 8th. 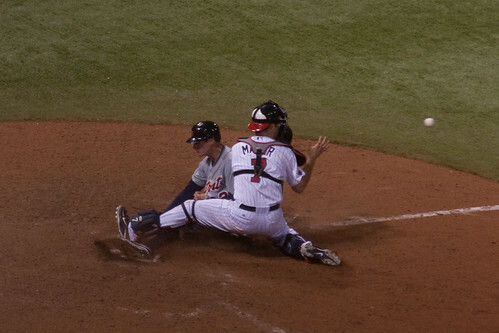 Both teams scored a run in the 10th, and the Twins almost won it then but had the winning run thrown out at the plate. 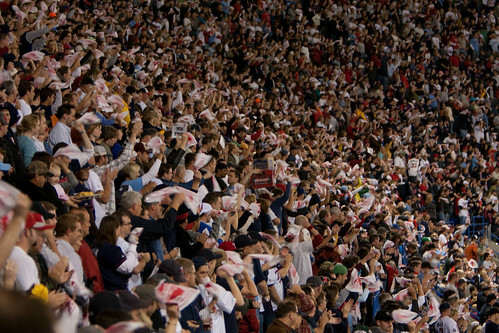 Finally, the Twins got a run in the 12th to win and move on to the playoffs. It was just a ridiculous game, especially considering the situation. After the game, I went out for drinks with Eric and Chad, after walking what seemed like 12 miles from the dome to find the place. Crashed the night on Chad’s couch, and then it was off to the airport again bright and early in the morning. I was at McCarran for my third day in a row when I got back to Vegas. Played some poker, got some sleep, and then Thursday it was back to the airport again for the fourth day to head back to Santa Barbara. This was the end of my baseball trip. I did go to a bunch of Dodgers and Angels playoff games the next week, though. I’m combining these three games into a single post, mostly because I want to finally get finished with the baseball trip write-ups. It has dragged on far too long. 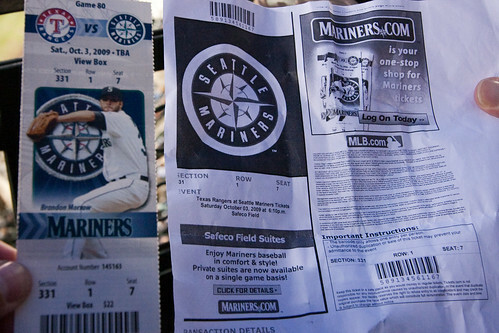 I went to all three of these games with Jim. 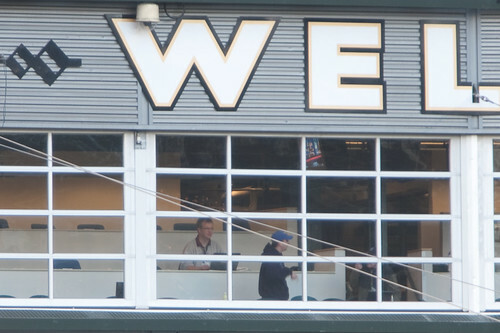 The first of them, I sat in the outfield, and he was up in the press boxes doing stat recording. It was freezing, but I still had to get my ice cream helmet. Here’s Jim doing his stat thing. He’s the guy sitting at the laptop. 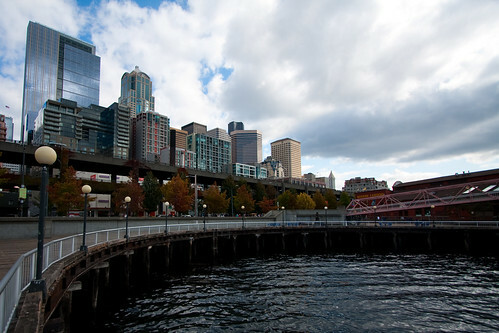 The next day, I spent a bunch of the day walking around Seattle. I ended up walking from the hotel to the stadium. Got a few pictures along the way. This game was apparently oversold. Someone else had the same ticket. 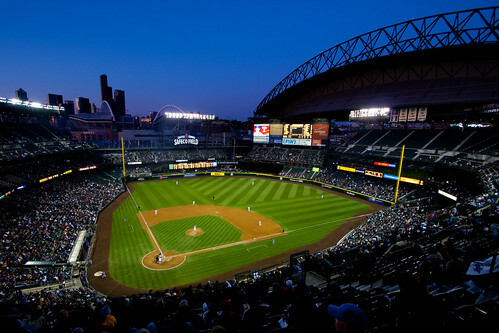 I also got my stadium shot of Safeco at this game. 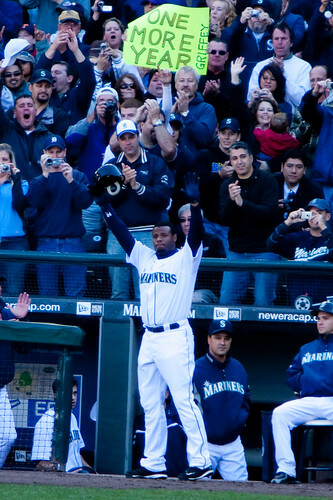 The Mariners beat the Rangers 2-1, and Ken Griffey Jr. hit his last home run of 2009 at this game. As of the moment, it’s the last of his career, but he will probably end up hitting one this year. It was cool to see, though. 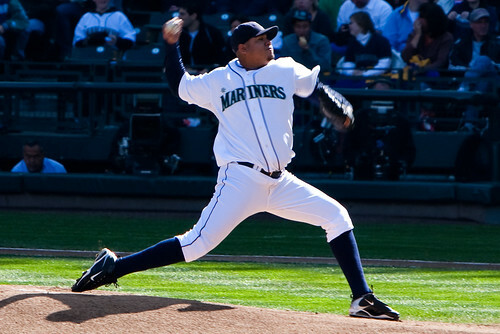 The third game in Seattle, I got to see Felix Hernandez pitch. Awesome. He pitched into the 7th, and gave up 3 earned runs, but he was better than that. Only allowed 3 hits, and got his 19th win. Griffey also got his last hit of the season and was removed for a pinch hitter. The crowd wanted him back for another year. 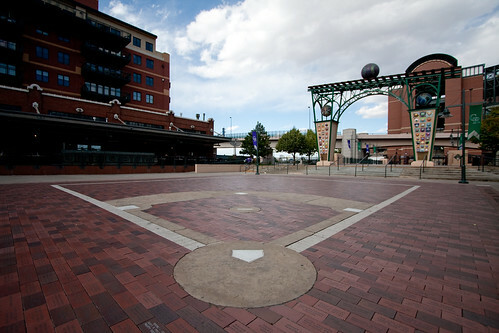 After the afternoon Rockies game, I walked from Coors Field to the Pepsi Center. It was about a half hour walk, with a stop at Fedex Office to print my ticket for the game. I got there a while before they opened the doors. 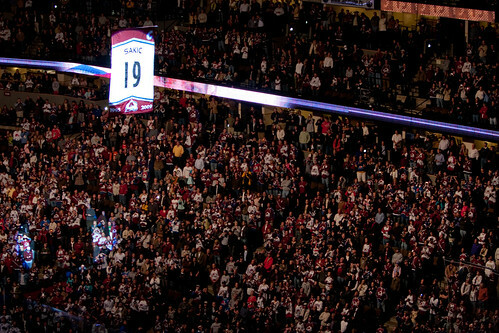 It was the Avalanche season opener, and before the game they retired Joe Sakic’s jersey and number. The Avalanche jumped out to an early lead, and ended up winning 5-2. 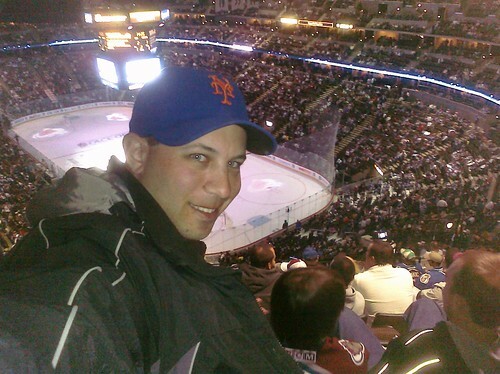 I don’t go to too many hockey games, and it was fun being there. I need to get to some more. 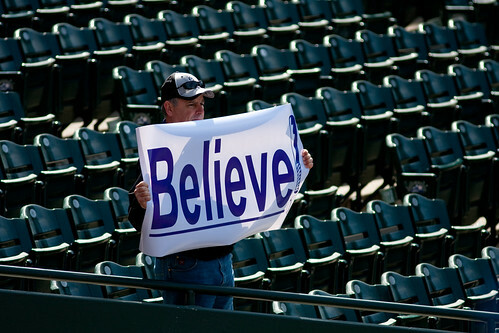 With the Rockies magic number at one for a playoff spot, this was a big game. With a victory, they would clinch the wild card. 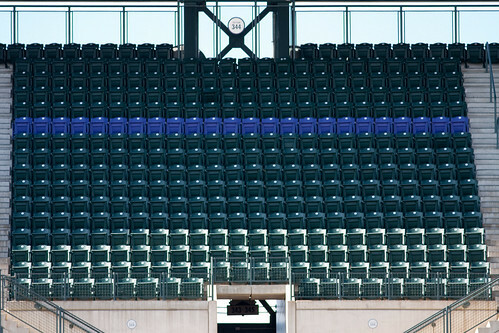 I got there very early, and there was no batting practice, so I just wandered around the stadium with my camera. The game wasn’t close. 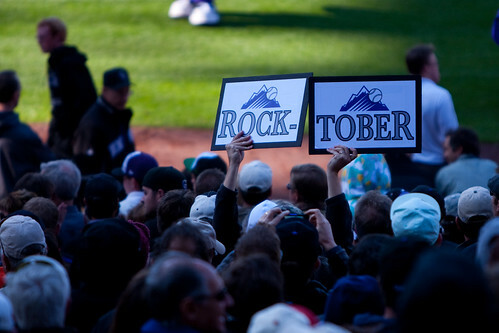 The Rockies came out with a run in the first, four in the third, and won 9-2. 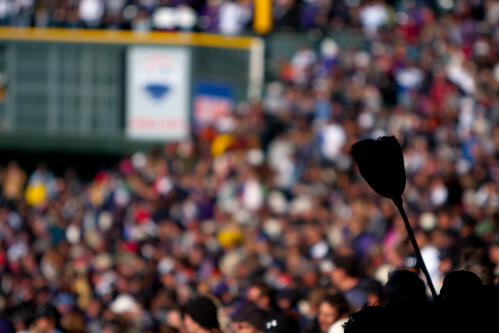 They swept the Brewers and clinched a trip to the postseason. After the games in Miami, I took a few days off to spend in NY and NJ with family, and then it was back on the road to more baseball. 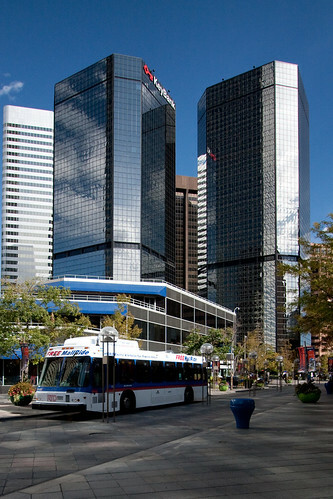 I flew from JFK to Denver, took the RTD downtown and then the free 16th street bus which dropped me off right in front of my hotel. 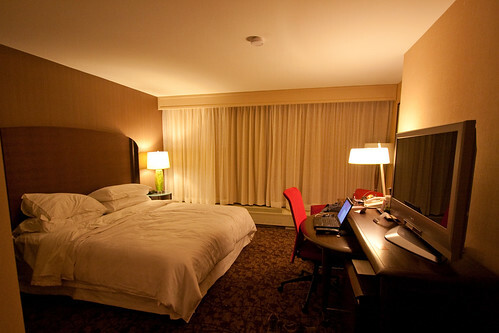 The Denver Sheraton is a nice place, and the Pricelined price was great. 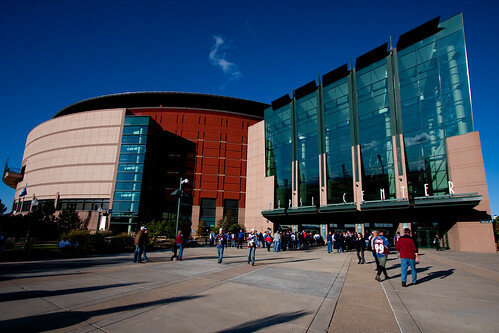 If you’re ever headed there for just downtown and sports, there’s no need at all to rent a car. I got settled in, and as I had done a few other times already on the trip, went to the game that night which wasn’t on my original schedule. I got a ticket on Stubhub in the front row of the upper deck behind the plate. 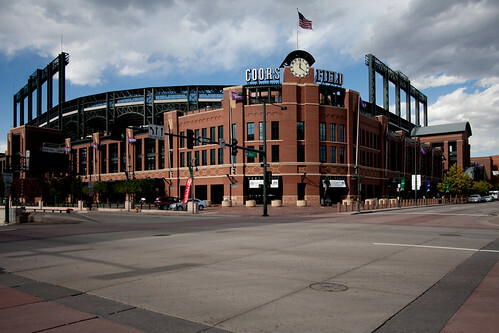 I walked up 16th street a little bit, taking some pictures along the way, before getting back on the free bus and then walking four blocks to Coors Field. 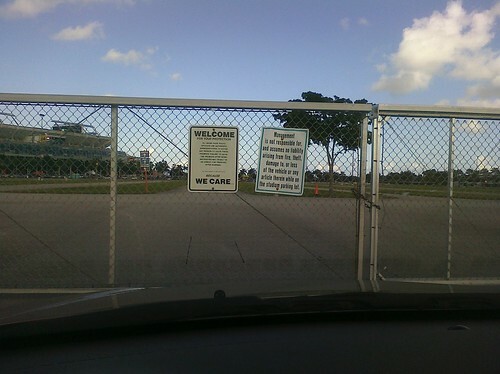 I got to the park very early, and had to wait before I could go in. 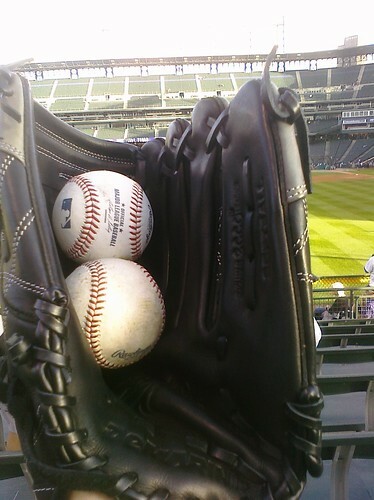 I was there for batting practice, and caught another couple of BP homers. I’m pretty sure they were both off the bat of J.J. Hardy, who was really putting on a power show. 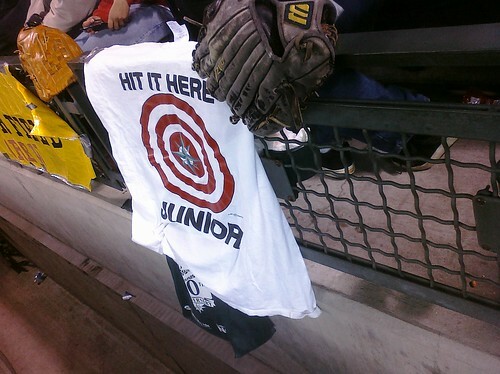 It seemed like everything he hit went to the back of the section in the outfield. I guess he can’t hit real pitching, though, because he didn’t play in any of the games I saw. 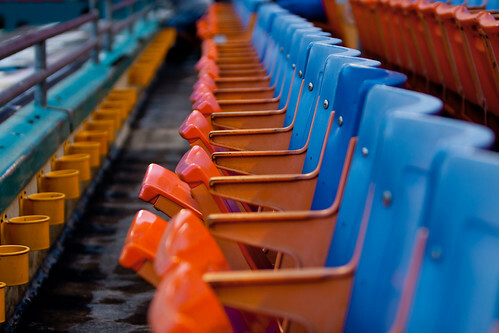 I also wandered around the stadium, making sure to stop by the mile high row of seats. 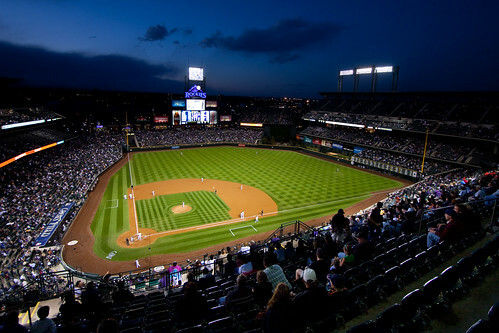 The game was a close one for the first 5 innings, until the Rockies blew it open with five runs in the 6th and 7th, for a 10-6 victory. It put their magic number to clinch a playoff spot at one. 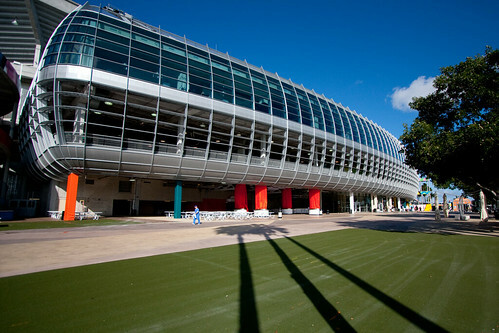 And of course, I got my stadium shot. Another Mets game I go to, another loss. Wait, what? They won? How’d that happen? I don’t know how they did, but the Mets finally won another game I attended, after a 9 game losing streak. This ran my season record to 3-10. They jumped out to a 3-0 lead on a Francouer homer, but Hanley tied it up at 3 with a home run of his own, and then the Marlins took the lead. The Mets scored a run in the 8th, two in the 9th, and then Frankie shut down the Marlins in the bottom of the inning to hold on for a 6-5 win. Amazing. 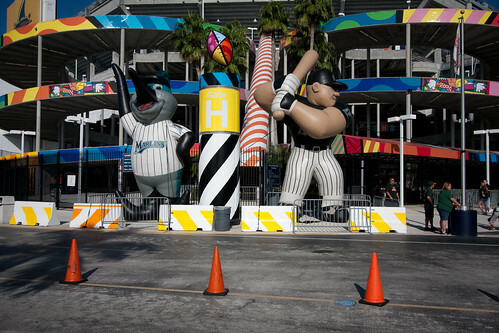 The Marlins website was full of all sorts of misinformation about when the gates and parking opened up, so I got there a little bit early. Before the game, I wandered around the stadium a little bit. 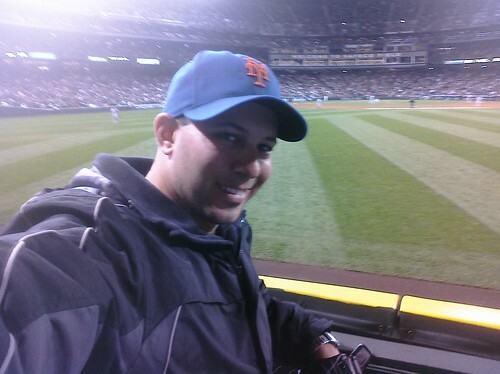 This was one of the games on the trip I was really looking forward to, because my seat was right on top of the Mets dugout. 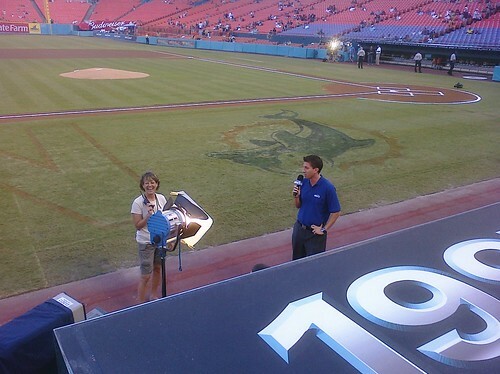 I even got to chat with Kevin Burkhardt a little bit while he was sitting in the camera well. Here he is doing some pre-game stuff. 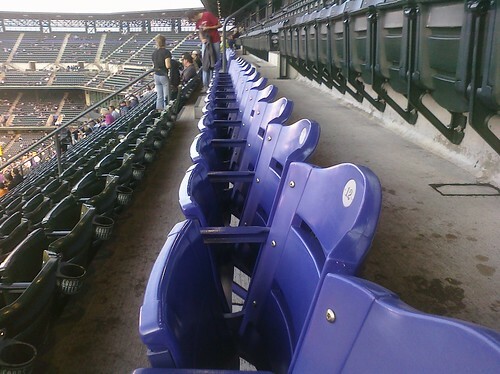 The seats I was in, which they call the Founders Club, are in Mets colors. Blue and Orange! Not really sure why. During the game, I was sitting next to a father and son. 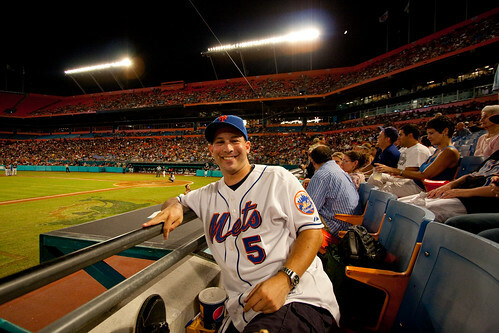 The father was a Mets fan from New York, the son grew up in Florida but was also rooting for the Mets. I caught a ball Razor Shines threw into the stands during the game, and gave it to the kid. Did you know the Marlins have cheerleaders? I didn’t. I had to stand up so they could walk by to get on top of the dugout. They’re called the Marlins Mermaids. 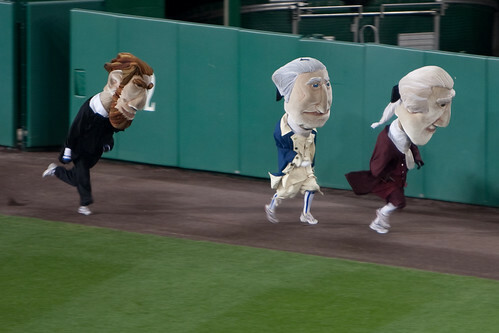 And of course, the picture of me at the game. I woke up bright and early at 5:30 to get on my way to IAD. 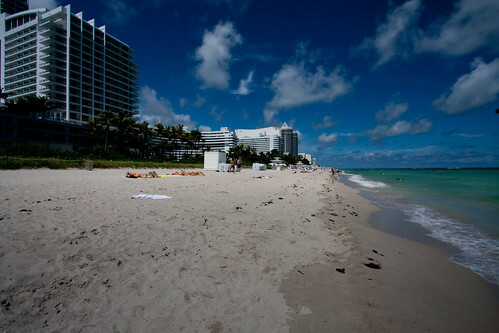 Flew from there to Fort Lauderdale, and picked up the rental car and drove to the hotel in Miami Beach. After check-in, I went outside to check out the pool and the beach. 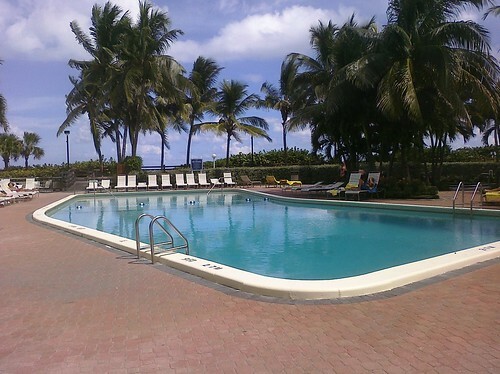 The pool was very nice, and then out just past was the beach. Beautiful place. 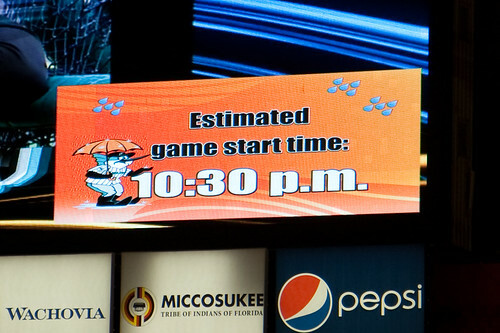 Somehow, I didn’t need to get any sleep, and went to the Phillies/Marlins game that night. It wasn’t on the original plan, because I hadn’t scheduled any games on days I flew, but I’m glad I went. One of the baseball highlights of my trip happened in the 9th inning, after the 45 minute rain delay in the 8th. 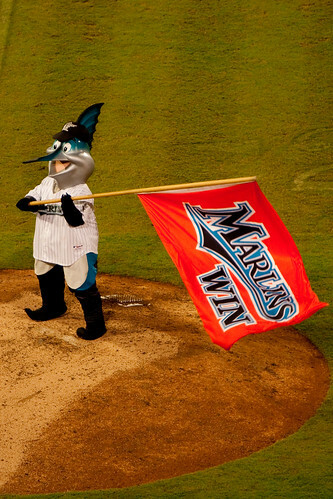 The Marlins beat Brad Lidge, scoring 2 runs in the bottom of the 9th (after a run in the 8th) to win. 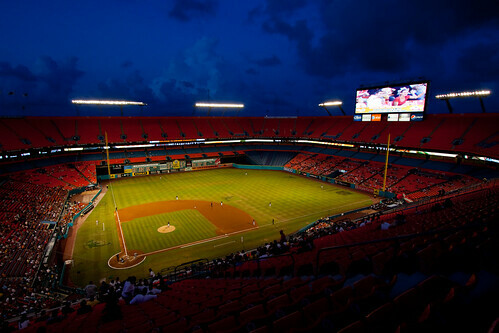 …and of course, the stadium shot. 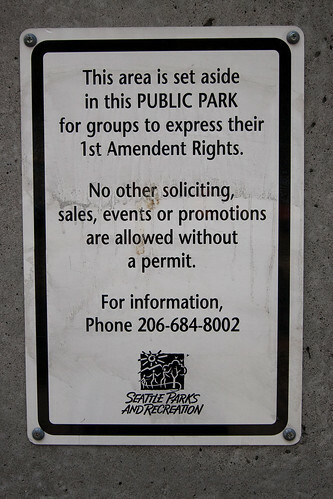 Not too thrilled with this one, but they’ll have a new park for me to shoot in 2012. I spent the day in Washington running errands. Had to make a trip to the bank, and the post office to send some of the things I collected on the trip home, because my suitcase was getting close to the 50lb mark. 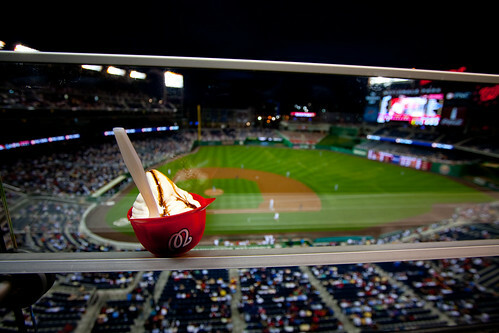 After that, waited for Jason to get back home and headed out to the game, via the DC Metro. We met up with Ryan, who I hadn’t seen since college, before the game and then went into the park. 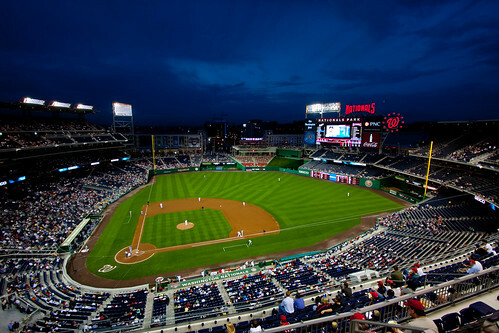 The Dodgers destroyed the Nationals 14-2, with Livan Hernandez taking the loss. I did get to see Adam Dunn hit a home run, though. Casey Blake homered for the Dodgers, and they had a 6 run and 7 run inning for most of those 14 runs. Hiroki Kuroda gave up 2 unearned runs in 6 innings for the win. 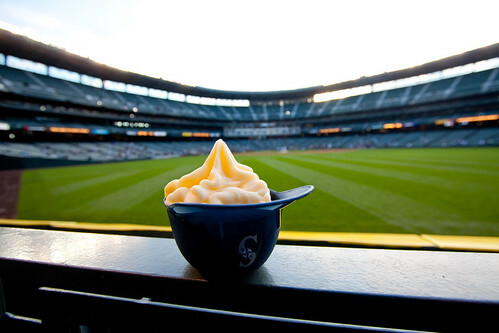 Of course, I got my ice cream helmet. 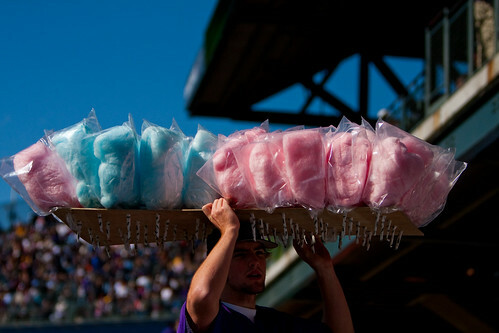 It would be the last one until Seattle, as both the Marlins and Rockies had run out for the season. 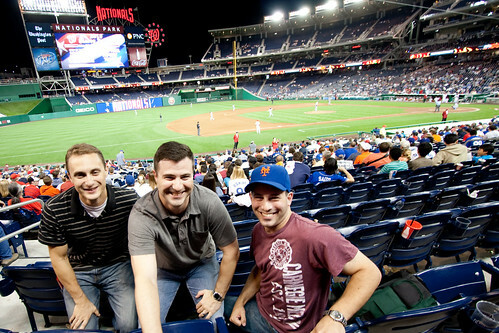 Here’s the three of us at the game. And, as always, my stadium shot.